Suransky discussed recent experiences of Africans migrating to South Africa. As a South African who currently lives in South Africa and has significant working experience in Europe, the issue of xenophobia and migration is of particular importance to Leonard Suransky, head of the International Relations Department at Webster University (Ghana) and previously a faculty member at Webster Leiden. Suransky's interest to delve more into the subject was sparked by a recent xenophobia attack in 2015 in South Africa. Most of the victims of this attack were Somalians. His public lecture, "Xenophobia and Migration: South Africa and Europe” mainly focused on South Africa, defined xenophobia and looked at its psychological aspects. 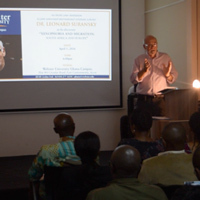 With 40 people in attendance, it was an engaging night of intellectual discussion, including the general public and several attendees from the Ghana Armed Forces Command and Staff College. Guests engaged in a "Say No to Xenophobia" campaign. To put the lecture in context, Suransky began by defining how xenophobia emerges when people fear things that are different and foreign. Sometimes this feeling generates hatred. He called the acts by people with such hatred barbaric, having no place in our society. As the case of South Africa was discussed, he said an identified trend was that victims of these attacks were usually foreign Africans. There seems to be the fear of Africans who came to South Africa in search of a better life, which he called Afro-phobia. The session closed with questions and comments, followed-up by a reception and networking. Thanks to this lecture, one of the leading television stations, TV3, featured Suransky on its morning show to share his views on the same subject. 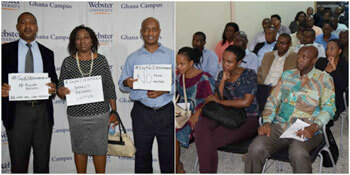 The event was part of an on-going series of public lectures at Webster Ghana inviting expert local and international faculty to speak on current topics on interest.